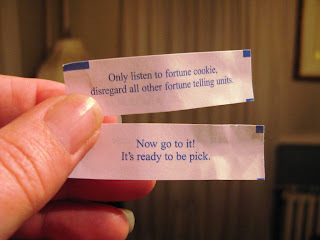 nancy rosetta: The best fortunes ever! Scott got take out chinese food the other night. He got two of the best fortunes I have ever seen. He is so proud of these fortunes, I don't think he will ever throw them away. Click the picture to embiggem, if you can't read them small. This was a great blog post. Just hysterical!